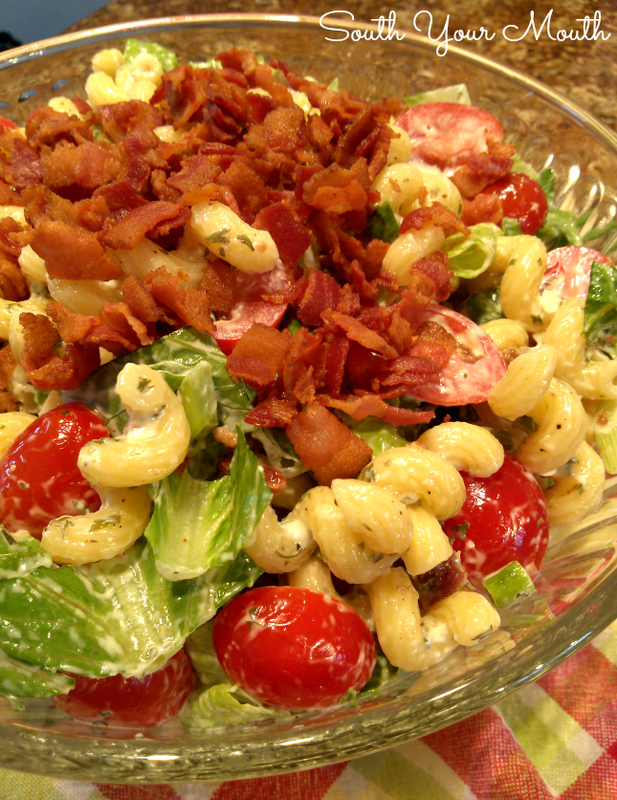 BLT pasta salad with crispy romaine lettuce, grape or cherry tomatoes, fresh bacon and a little ranch dressing. Spring is here! Hallelujah! Actually, I’m not excited about that yet because I haven’t finished all my spring cleaning and I feel very behind but I’m trying to psych myself into be happy about it. Spring is here! Hallelujah! Hallelujah! Hallelujah! To help get myself in the mood, I did something this weekend I do almost every weekend during the spring and summer. I made pasta salad! I like to keep pasta salad in the fridge for cool, light lunches and side dishes when it’s warm out. It’s easy to serve, it’s filling and it makes me feel better about eating sandwiches at lunchtime. Again. I used my Creamy Macaroni Salad recipe as a jumping off point for this BLT salad because it is such a great recipe! I’d like to think about adding chopped chicken or avocados to this in the future. And I think I’ll be doubling this next time because my brood wiped out this whole batch in 24 hours. For reals. Cook pasta in liberally salted water per manufacturer’s instructions for al dente preparation. Drain pasta then rinse in cold water. Drain again then immediately add pasta to a large mixing bowl. Don’t let it set and dry out too much, you want the pasta to still be on the moist side for the next step. Add parsley, garlic, salt, pepper and Dijon mustard to pasta and stir until well combined. Let pasta “marinate” in the seasonings for 15-20 minutes uncovered at room temperature. Doing this allows the pasta to soak up the flavors of the parsley, seasonings and mustard before adding the mayonnaise mixture. While pasta is “marinating”, slice bacon into 1/2-inch ribbons and cook until crispy; drain from fat and set aside. I know this seems like a lot of bacon but remember we lose half or more of it in rendered fat after cooking. You can use less if you're using lean or center-cut bacon. Remove softer, outer leaves from lettuce and reserve for another use. Roughly chop approximately 4 cups from the inner (more crunchy) leaves; set aside. Whip together mayonnaise, ranch dressing and vinegar then add mixture to the cooked pasta and stir to combine. Add half of the bacon, tomato halves, chopped romaine and green onions to pasta and gently stir until all ingredients are thoroughly combined. Top with remaining half of bacon and serve immediately. If you’re not going to serve this immediately, mix all but the romaine and second half of bacon. When you’re ready to serve, toss pasta with romaine then top with remaining half of the bacon. This sounds so awesome. I love pasta salads and look forward to making them this summer when our little tomatoes start coming in! Pinning this to try! Thanks! I just made this recipe, nice and refreshing, I just added a little more ranch,not much but in my opinion,delicious. Thanks for the recipe I will be using this quite often this summer.